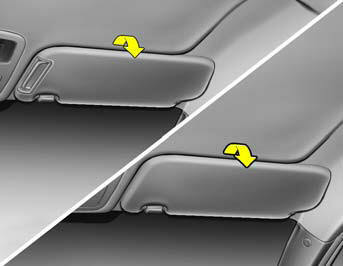 Ticket holders and vanity mirrors are provided on the back of the sun visor for the driver and the front passenger (If Installed). The Supplemental Restraint System (SRS) label containing useful information can be found on the topside of sun visor. o Do not place the sun visor in such a manner that it obscures visibility of the roadway, traffic or other objects. o Do not move the sun visor out to cover the side window if there is an item attended to it such as a garage door remote control, pens, air fresheners or the like. These objects could cause injury if the curtain airbag is deployed.